DIABOLICAL DYNAMICS is a cooperative game rather than a head-to-head competitive one. 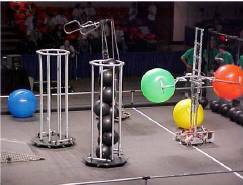 An alliance of four teams/robots scores by getting balls into goals, by having each robot in the End Zone at the end of the match, and by balancing the goals on a teter-totter bridge at the end of the match. The alliance has several interesting options, such as, ending the match prior to the two minute time limit for a bonus or transporting an inoperable robot across the field using a stretcher to the End Zone. The competition is composed of two phases: Qualification Matches and Elimination Matches. In each match, four teams work together as an alliance to try to achieve as high a score as possible. All teams in an alliance share the alliance score. However, during the qualification matches some teams may earn additional bonus points that apply only to their team. During qualification matches, randomly assigned teams are partnered to form alliances just prior to the start of each match. Alliances last only for the duration of a match. At regional events, teams may be randomly allied with any other team at the event. At the National Championship, each team is assigned to one of four divisions and participates only with other teams in the same division. All teams are ranked after playing an equal number of qualification matches. Following the conclusion of the qualification matches, the top ranked teams form alliances and go on to compete in the elimination matches. Alliances formed for the elimination matches stay together for the remainder of the event. Each alliance is composed of five teams. The fifth team serves as an alternate and can be used if a robot in the alliance is damaged or for reasons of scoring strategy. At regional events, four alliances compete in a series of elimination matches until one alliance is declared the event champions. At the National Championship, eight alliances compete in a series of elimination matches, resulting in four Division Champion alliances and one National Champion alliance. Positioning the robots in the End Zone at the end of the match. Moving the goals onto a semi-stable bridge. The bridge must be balanced at the end of the match. Ending the match prior to the two minute time limit. Carrying a robot across the field by using a stretcher if the stretcher is in the End Zone at the end of the match. Each alliance competes using four (4) team-built robots, twelve (12) students, and eight (8) mentors. There are forty (40) small balls, approximately thirteen (13) inches in diameter. There are four (4) balls approximately thirty (30) inches in diameter. There are two(2) seven (7)-foot high goals with caster wheels around the bases that may be moved around the playing field. One goal starts near the Start Zone, the other starts near the End Zone. Dividing the field in half is an eighteen (18)-inch high railing with a central bridge. Robots may pass over the bridge or rails to access the opposite end of the field. The bridge is centrally supported on a beam approximately six (6)-inches wide, such that it may tilt toward either end or remain level. The robots must compete within the bounds of the playing field, while the students are located at stations just outside the playing field. Only students and robots may score points with the balls. 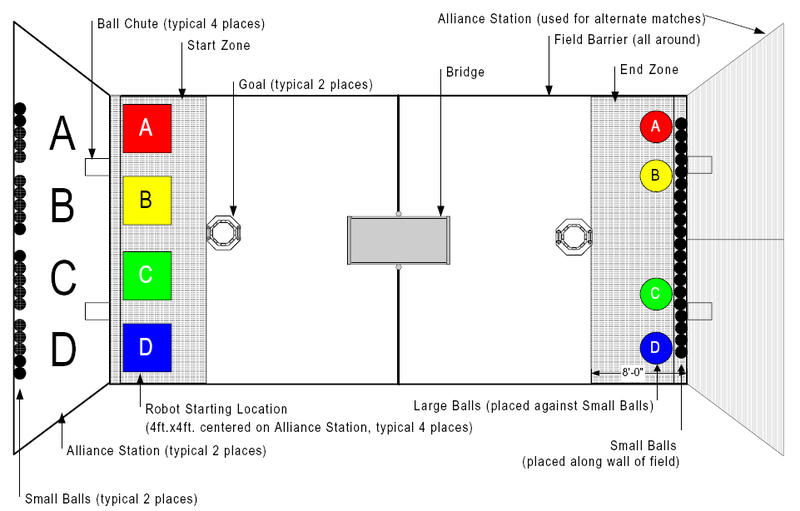 At the start of each match, the alliance station contains twenty (20) small balls. Twenty (20) small balls and four (4) large balls will be located at the far end of the playing field. All balls may be used to score points. Teams may opt to use a stretcher, on which a robot may be conveyed around the field. If the stretcher is used, it must start in the same position as the robot on the stretcher would normally start. At the end of each match, points are awarded as outlined below. One (1) point for each small ball in the goal, and not in contact with or supported by a robot. 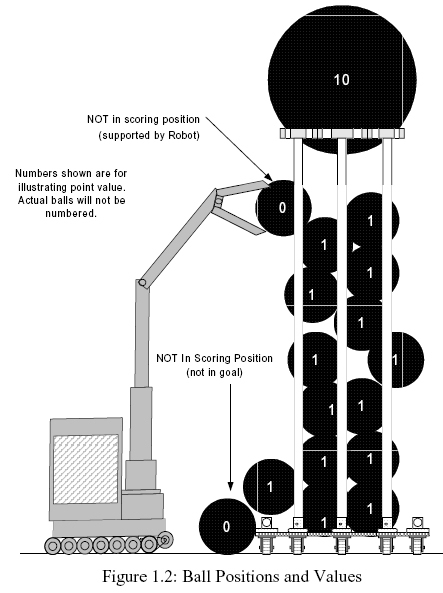 Ten (10) points for each large ball in the goal, and not in contact with or supported by a robot. Ten (10) points for each robot in the End Zone. Ten (10) points if the stretcher is in the End Zone. The alliance doubles its score for each goal that is on the bridge if the bridge is balanced. The alliance multiplies its score by a factor of up to three (3) by ending the match before the two minute time limit. Each team receives the alliance score. b) A team multiplies its score by 1.1 if its large ball is on top of a goal. c) Scores are rounded up to the nearest whole point after applying all applicable multipliers. 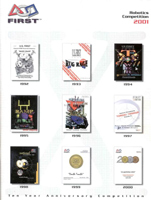 33 Teams (.pdf, 19KB) attended the 2001 SBLPI LI Regional. 335 Teams (.doc, 445KB) attended the 2001 Championship. 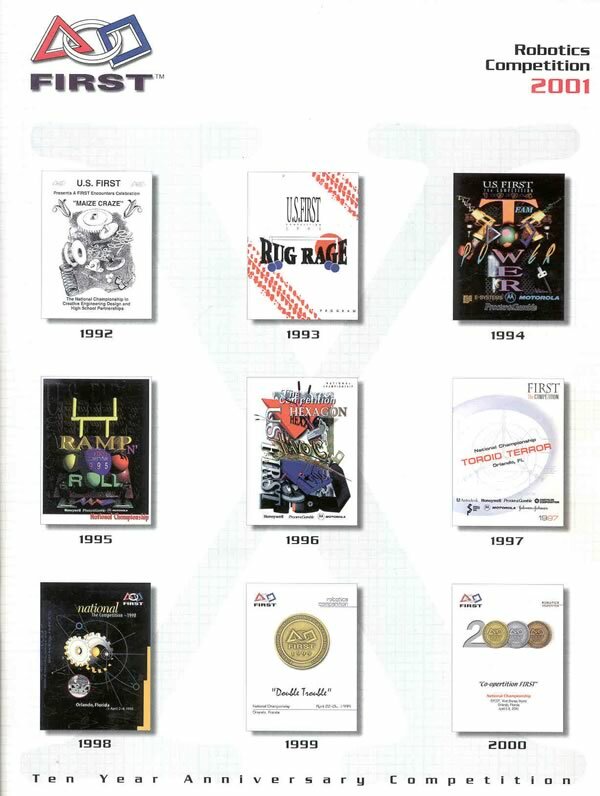 515 Teams (.pdf, 190KB) participated in the 2001 FIRST Robotics Competition at 13 Regionals.